Tejas Volleyball is a family-owned and oriented volleyball club in the North Texas Region. The goal of Tejas Volleyball is to provide the finest possible volleyball experience to every athlete that is involved in our program – as a player, person, and student/athlete. To achieve that goal, we strive to maximize the individual skill level of every player, and then combine those players into the best possible teams. We stress the development of fundamental technical skills, learning to work together as a team, and personal habits that lead to success in any walk of life. To help each player reach their potential as a student/athlete, we have assembled what we believe is one of the best coaching staffs in the country. Tejas Volleyball can only achieve their remarkable success by attracting the best student/athletes from throughout the Dallas-Fort Worth area. We consistently search for players who want to excel on the volleyball court with the goal of eventually competing at the collegiate level. The Tejas Volleyball Club, serving the Dallas-Fort Worth area, is a nationally acclaimed Junior National training club. Its impact is evident in the North Texas Region, nationally, and collegiately. Tejas Volleyball was formed in 2004 with very humble beginnings (1 team). With a commitment to individual player development and athlete recruitment, Tejas Volleyball has grown to one of the largest and most successful clubs in the nation. Since the clubs inception in 2004, more than 100 of its athletes have gone to college on volleyball scholarships. Since 2004, Tejas Volleyball has qualified more than 50 teams for the US Volleyball Junior National Championships – a feat that only a few clubs in the entire country can claim. Tejas Volleyball currently operates out of the North Texas Event Center in Euless, Texas. With easy access, ample room around each court, spectator seating, and high ceilings it is an ideal facility for volleyball training. The facility has 5 regulation volleyball courts, an indoor soccer field, Pepe's Pizza (coming July 2017) and concessions, and a 2,000 square foot retail space that will house Shuluxe (coming July 2017). Tejas Volleyball Club’s mission is to produce technically skilled volleyball players who aspire to compete at the highest possible level. To achieve this, our highly trained coaches provide focused, skill-based instruction in a supportive, team-building environment. Tejas Volleyball will cultivate a strong work ethic, a passion for competition, and a commitment to team culture to enable players to reach their full potential. No outside food or drink is permitted inside the Tejas Volleyball facility. 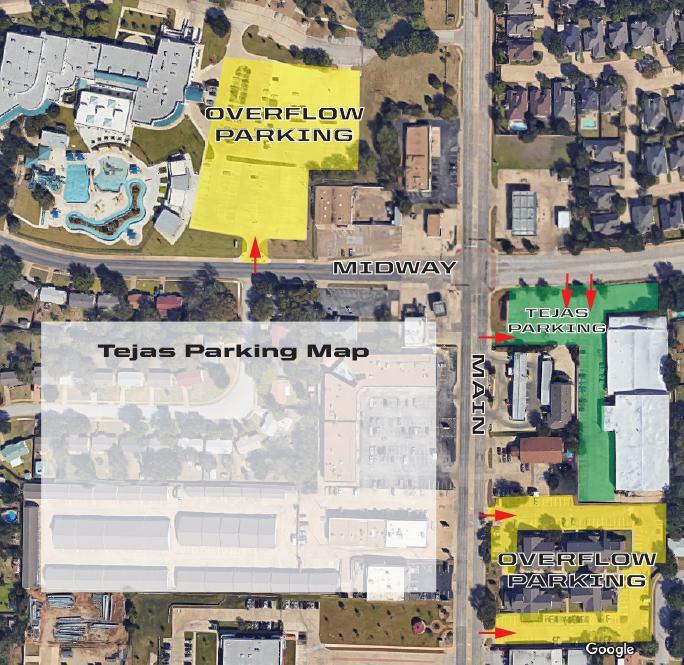 Parking is available at the Tejas facility. Our parking lot includes the corner parking lot on the southeast corner of Main Street and Midway. There is additional parking at the office complex directly to the south of our facility (entrance is on Euless Main Street) and at the Euless Rec Center (located on the NW corner of Main Street and Midway).